I have been rather quiet lately as I was away on vacation with my husband in Colonial Williamsburg, VA. It is a magical place to me, as this is my eighth visit and I never tire of it. Currently, I am counting the days until I can return there! 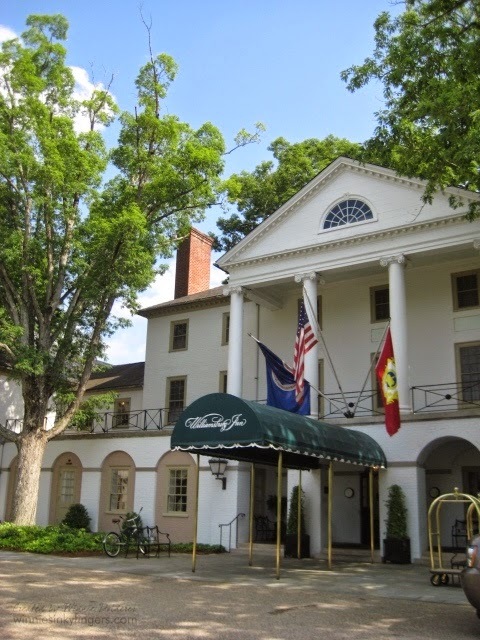 One year my mom took me for tea at The Williamsburg Inn, and I loved it. Now, my husband and I make it a point to plan an afternoon visit there for their Afternoon Royal Tea. It is such a beautiful inn, and even Queen Elizabeth has had tea there when she visited. The setting was lovely and the view of their gardens amazing. The food was delicious and the tea was very nice. I went for the Earl Grey as that is my favorite. 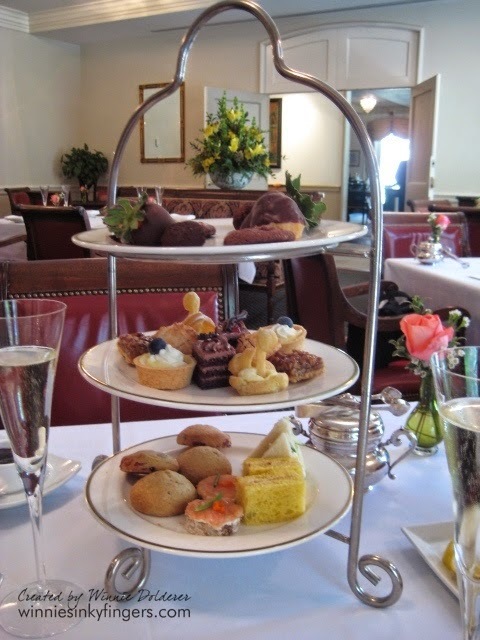 The weather in Virginia was very hot, and the slowing down in mid-afternoon for tea was just what I needed. There is very little in life that is better that a leisurely tea with your sweetie. I am very glad mine likes to join me in this ritual. These yummy treats really bolstered me up for what was to come that evening. My husband and I took part in an evening program called In Defense of Our Liberty in which we joined George Washington's militia! Yep, it must have been a sight to see me try and march and follow orders. I was very clumsy and off count in my marching, and nearly fainted when the officers came at me with bayonets (I am short so I was in the front row!). It was a real eye opener for me and I can't tell you how much I thanked our soldiers past, present and future that night. If you are ever in Virginia, I highly recommend you pay a visit to Colonial Williamsburg, and of course have tea at the Inn! Sounds like your vacation to VA. was wonderful. The tea room sounds lovely and I like the tiered stand holding the tea treats. You were brave to join the march! I guess I would have been out front too as I'm only five feet. Thank you for sharing your trip to Virginia with us and joining me for tea. Have a wonderful day. My late beloved husband and I went to Williamsburg for our honeymoon back in 1970. I loved it, but have never been back, but would love to go again. 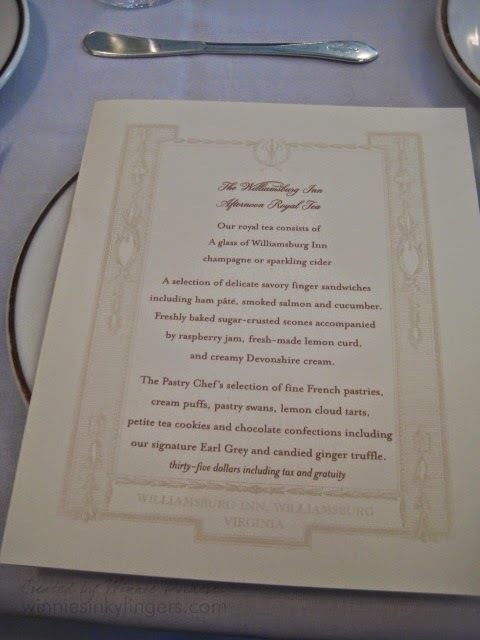 Having tea at the Williamsburg Inn would be wonderful. Wonderful! I have always wanted to visit Williamsburg. The tea looks wonderful. Thanks for sharing the photos. What a special place to enjoy afternoon tea. I have never been to Williamsburg yet but I hope to someday. Thanks for sharing such a sweet post. What a wonderful experience. I am from Yorktown, Virginia and graduated from York High School 1966. I am very familiar with Williamsburg and how lovely it is but also - yes how hot it can be for sure! Winnie, thanks for sharing your wonderful tea experience! I live in Virginia and went to college in Williamsburg (William and Mary) and I love it there. 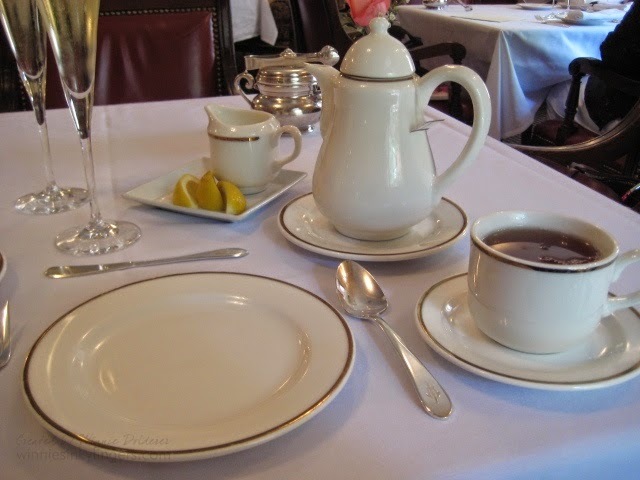 I went to tea once at the Williamsburg Inn--it was a wonderful experience. Thanks for taking me down memory lane! I completely agree about Williamsburg being hot and also humid!